Hola Lexicans! 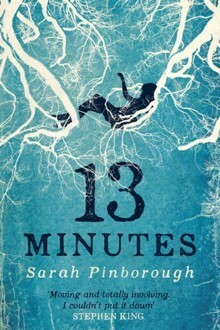 Today, I'm going to be reviewing the book Thirteen Minutes by Sarah Pinborough so let's jump right in! When Natasha wakes up, she is on a hospital bed with no memory of the past 24 hours and has been told she was drowning in a river and was dead for 13 minutes before a local passer-by rescued her and the hospital team revived her. She is expecting to go back to being her popular, normal, everyone-wants-to-be-her self but her friends are acting a little weird. And as Tasha and her old friend begin to look at the facts, not everyone is as it may seem. that there aren't enough good murder mysteries for teens and YA so when I popped into my Waterstones and saw this mystery book in the YA category I just knew I had to pick up a copy. Because this was the sort of book I had been looking for, I had high expectations for this book, so I couldn't wait to start reading it. The couple of pages were a little confusing, I had to keep re-reading them before they made sense, but that was more likely because it was late at night, I'd had a long day in London watching The Lion King (my review here) and I was on a train but once I got into it, I was gripped. Whilst a lot of the characters really annoyed me sometimes, it was a very good plot and was fast-paced and well-written. I would definitely recommend this book to anyone who loves mysteries or books that are gripping and full of suspense because this book certainly is. It also has a very modern vibe, on a different version to the cover I have a photo of above, there is the quote 'Mean Girls For The Instagram Age' which I think is very true! Overall, I lovedddd this book a lot, and true to its genre, it doesn't disappoint. Have you heard of this book? Does it sound like something you'd like? This sounds interesting! I haven't read a lot of mystery, but I'd like to try a new genre out. I'll have to check this out! oh I always struggle to find really good mysteries too! BUT THIS SOUNDS GLORIOUS THEN. I also toootally love that cover. (Shh, yes, I'm a complete cover-judger hheheh.) I'm so glad this one lived up to expectations for you! !